Home Gadgets Technology Why to go for eBook Conversion from General Format? Why to go for eBook Conversion from General Format? In case you are already a holder of a published book, then you must have decided to print paper copies for the sake of tradition. Rather than throwing your money away, it is better to go with getting the same converted to eBook format. eBook readers have been reported to be well equipped with a plethora of powerful features that are highly enticing desired readers for straying away from hard covers and paperbacks. eBook conversion has become popular in terms of sake of travelling convenience along with immediate accessibility and cost efficiency. Conversion into eBook forms has really proved to be a highly cost efficient investment. It is high time to bid goodbye to those days when writers were supposed to hire agents for marketing their books for rejection purpose maximum times. With the upcoming of eBook, you may pen down the bestselling novel and self publish your literary gem within a fraction of original cost. 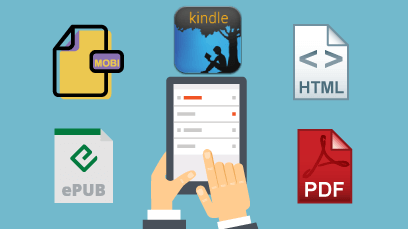 Among several eBook platforms to choose from, it is better to give a trial to ePub conversion. ePub books are well known for getting displayed in a crystal manner on electronic readers. eBooks are on their ways to set a new precedent into the book industry as the market is experiencing a monstrous surge. It has become easy to prepare and upload books at an instant onto proper platforms. As books can be easily availed in an electronic format, billions of people from all over the world will be able to purchase your published book at an instant through proper marketing strategies. Potential readers will be able to enjoy the opportunity of browsing the book at their own comfort. In maximum electronic platforms, royalty rates are considerably higher in comparison to that of traditional publishing houses. The ePub offers authors a favourable amount of royalty that enhance their interest into the field of writing. While incurring upfront costs for publishing, marketing and pushing your book ahead, you will definitely be able to reap financial success simultaneously. eBook in realty provides authors the authority for taking the best decision regarding books. Some vital places that require taking the best decision include pricing, titles, book covers and many more. Even there is a possibility that the cover art may contribute in enhancing and degrading the impression of an eBook. Along with following strategies of the publishing house, it will be better to take the best control of marketing the book for the convenience of reader. Also, if you are able to procure an awesome cover art, then the eBook from your side will entice readers to pick up your book immediately. It is good to learn that eBooks have been known for yielding highly incredible editing perks as well. In case of an eBook, you may easily make desired changes into your manuscript at an instant without any hassle. No need to think too much as the best solution is within your clenched fist. All you need is to apply the same at the right time in a right manner.